July Taylored Expressions KI & Blast from the Past Blog Hops! Hey there everyone!! This month, the Key Ingredients blog hop and the July Blast from the Past blog hop line up on the same day! So, we decided to join in on both!! The theme for the July Blast from the Past blog hop is "Sending You Sunshine"...and I made the sentiment that exact title!! Beautiful card! Love the way its structured. I really love this card! Such a GREAT CAS card. I loved it when I saw it on the Inspiration Sheet. How GORGEOUS Lea! You are INCREDIBLE! LOVE these butterflies!! Wow, this is fantastic,, awesome design!!! Beautiful card! I love the sweet butterflies and the pins, very cute! Lea I LOVEEEEEEEEEEEEEEEEEEEEEEE this! I need this butterfly die! 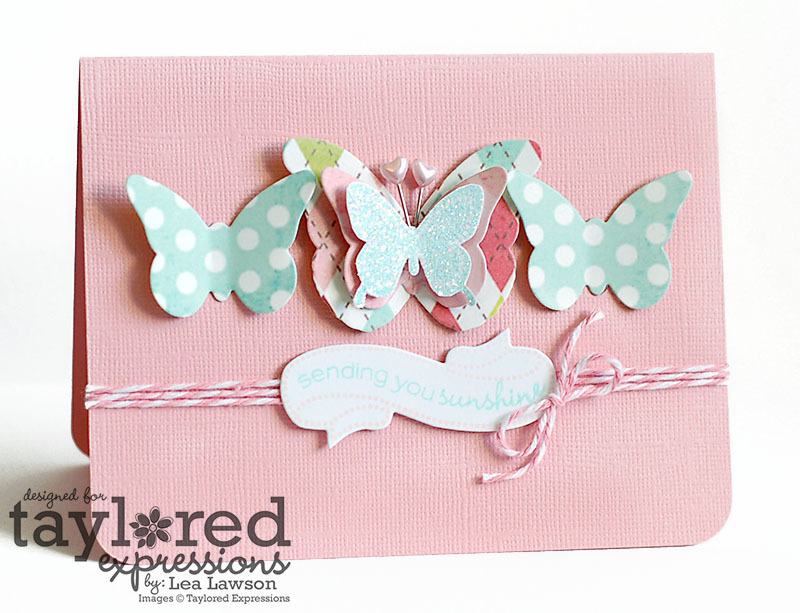 This is just beautiful, so soft and pretty--the butterflies are just perfect!